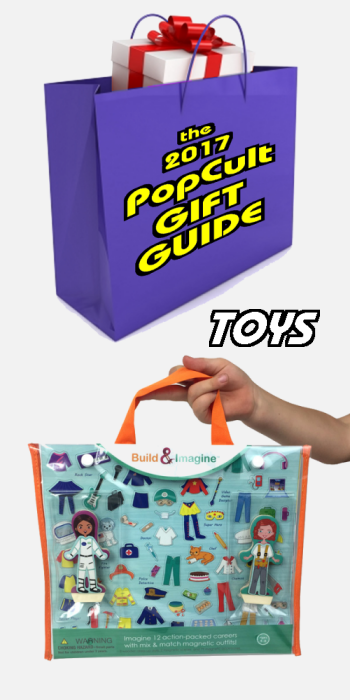 Today’s toy pick for the 2017 PopCult Gift Guide is part of a wonderful new toy line that mixes building toys with dollhouses, action figures, dress-up dolls and let’s kids use their imagination to create their own incredible inventions. Build & Imagine is a great new play system that uses a patented magnetic construction that captures the fun of the old Colorform-type playsets, but brings it into three dimensions. The line is aimed at girls, and includes a healthy dose of STEM play, but I see vast potential for boys to play with these toys too. A great entry level package is their Career Dolls set. Build & Imagine’s Career Dolls comes with two wooden dress-up dolls and 79 colorfully illustrated magnetic clothes and accessories that correspond with 12 different careers. 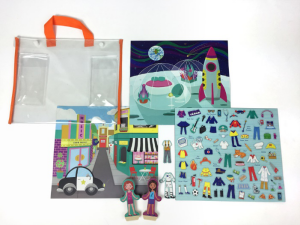 It features a reusable carrying case for easy storage and travel, and 2 standing magnetic scenes (a town and the moon) to enhance the imaginative play possibilities. From police detective to chemist to space explorer, children will explore a dozen different careers, some of which defy traditional gender expectations. Career Dolls is a great gift item to introduce a child to the world of Build & Imagine, or a fun way to extend the storytelling possibilities if you already have Build & Imagine StoryWalls building sets. The characters and magnetic clothing are compatible with other Build & Imagine sets and the carrying case provides a helpful way to store your Build & Imagine magnetic accessories and dolls. This set retails for under twenty dollars, making it a very affordable way to empower young girls. You can order it from their website or Amazon, or find it in select Target stores. The play value is ample here. The dolls are solid and well made, but the clothing goes on and comes off as easy as it does with a paper doll, easier actually, since there are no tabs to fold. Kids can use their imagination to create their own adventures without any limits. They can tell traditional stories, or make up stuff about space police or superhero dog walkers. The handy tote bag makes it a great travel too, too. If you want to move beyond the Career Girls set, Build & Imagine offers a growing world of terrific playsets at varying price points. The larger StoryWalls sets include buildings that can be constructed in as many ways as a child can imagine, and every set can inter-connect. You can find information about their more elaborate sets, which include a pet portrait studio, a fairtale theater, a marine rescue center as well as houses and a large castle at their website. With high-quality construction, clever design and loads of play value, Build & Imagine sets can be toys that a child will cherish for their entire lives. 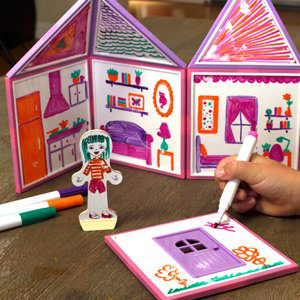 I was particularly impressed by their Draw & Build Dollhouse, which is a blank house that kids can draw on with wipe-off markers, adding a whole new level of play as kids have complete control over what type of house they make and also draw the people who live in it. This set is very affordable and can be found at their website and at Amazon.This is the kind of toy that I would have loved to have as a kid. I’m going to quote from their website, just in case my description isn’t doing it justice: “Build & Imagine is a magnetic dollhouse–like building blocks meets dollhouse meets dress-up dolls. It’s a unique mashup featuring adventurous characters and rich illustrated details that inspire girls and boys alike to build and imagine. “We can approach toy design in a more thoughtful way, and doing so is important. The simple act of combining shapes to form a three dimensional structure helps kids to develop foundation skills for science, technology, engineering, and math (STEM). Skills like spatial reasoning, problem solving, creativity, and design. ‘Kids will be engaged for hours with Build and Imagine. The dollhouse is new and different every time you play, and there are different building set themes to choose from. Endless design possibilities mean endless hours of creativity. This is a very thoughtful review. Thanks you for taking the time to communicate the details!